I already touched on this Monday, but what Rory is doing off the tee right now is just ridiculous. His distance relative to the field was only +18 yards, tied with Jason Day for best in the field, compared to +28 at the WGC-Bridgestone, but he again maintained superb control of his shots. He hit 12 of 14 fairways and was never forced to hit a recovery shot off his drive. His strokes gained driving was 2.5, tied with Justin Rose for best in the field. On his closing four holes (#15-18) – where he finished birdie-par-par-birdie – he hit every fairway and bombed it 31 yards past the field average. It’s become almost a cliche that the longest hitters come with wildness in their games, but Rory is pushing the limits of the distance and accuracy combination right now. After last summer’s disappointment at Muirfield where Westwood slept on a two shot lead going into Sunday, only to slog around for a 75 and watch Phil blitz the field with a 66, I figured Westwood’s major window was almost closed. He’s been declining from elite to merely good based on my numbers for the past few seasons. A lot of that should be attributed to age, but his decline from that 2009-2010 peak has been sharp. This round today was a masterclass in iron play and putting though. He had great iron shots into #4 and #17 to set up short birdies, but what was most impressive was how he consistently hit it inside 25 feet. So much of winning golf tournaments comes down to making putts, and when you give yourself twelve putts inside 25 feet sometimes you get lucky and sink eight of them like Westwood did. He finished the round 8th in putting, but more importantly 3rd in approach shots. He’s coming off a brilliant Sunday round at the WGC-Bridgestone. A lot was made this week about the choice facing players on #7. It’s a split fairway – left shortens the hole by ~40 yards, while right is more conventional and doesn’t require carrying it over water – par 5 with water coming into play around the green. Left was seen as the “bold” play I suppose, while right was seen as safer and more apt to be preferred by the shorter players. Thursday’s pin was very challenging – just twelve feet from the edge of the water hazard – which may have scared some guys off. Going off one day of numbers, it certainly looks like driving left gives the most advantage. Players going left (89) averaged 4.63, while going right (46) averaged 4.78. Those numbers remove club pros from the mix as they almost all skewed towards the safer right side. Shorter players did prefer the right side – perhaps because they were scared to take on the 225+ yard carry over water, but even many of those who played right didn’t actually fire at the pin, instead laying up towards the end of the fairway. Below I’ve plotted the first and second shots; gold are drives left and their second shots, blue are drives right and their second shots, drives in the middle water are in red, and the pin is marked by the white cross. Notice mainly how it was almost impossible for anyone driving the ball to the right to take on the green in two shots. Playing left not only shortens the second shot, but it’s almost the only realistic way to reach the green in two. Of the nine players to hit the green in two, eight played left. Of the 59 players able to go for the green in two, 56 played left. Now, hitting the green in two isn’t everyone’s objective on par 5s. Luke Donald, Steve Stricker, and a few others are more than happy to lay-up and fire in third shot wedges from <100 yards because they’re the best in the game at that shot. There’s no reason for Phil, Tiger, Billy Horschel, Marc Leishman, and several others to be playing that game though. Those guys are the players they are because they can hit greens in two. Hopefully with more forgiving pins located further back on the green we’ll see some of those guys drive it left and then let loose with a fairway wood. For a major championship course, Valhalla played exactly as a normal PGA Tour course on Thursday. The course average came in at +1 (72.1), though the PGA Tour players played it in 71.5. The rough wasn’t particularly penal compared to any other PGA Tour set-up (0.35 strokes harder than shots from the fairway, slightly easier than the WGC-Bridgestone last week) and it didn’t hold players back from firing at the greens. Only 5% of drives required a recovery shot afterwards, right in line with PGA Tour averages. And even though there’s danger lurking off the tee in the form of trees, water, and native areas, the percentage of non-fairway/bunker/rough drives was right in line with PGA Tour averages as well. The commentators seemed shocked that the course was so receptive to scoring, but it really isn’t any harder than these guys are used to playing. And it’s certainly not playing as long as the 7500 yard figure they kept quoting on TV today. Today’s tees/pins were set-up so it played around 7300; that’s barely longer than the average par 72 course. For this weekend, and especially after Friday’s rain softens the greens, the scores should remain reasonably low. Thanks to Ken Pomeroy for providing his in-play win probabilities. Here are his numbers after Round 1. 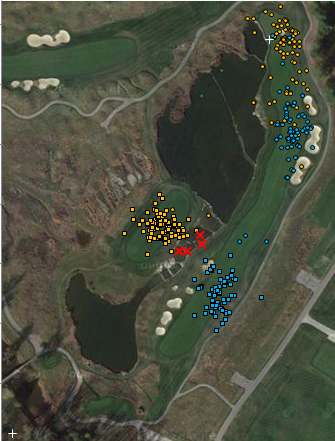 Loving the analysis…do you have access to the ShotLink data? Or are you scraping it from the Tour’s website? Or is there some other way to get this kind of data that I haven’t considered?